Rain's Garden: Mexican Dinner & Marlene's Birthday! The pack all had to "take their place" while Alex served the cake into their dishes. I kept trying to get their attention for the photo, but they wanted nothing to do with me lol...I didn't have the cake in my hands!! Marlene was allowed to go first, then the rest...the cake was devoured in less than 20 seconds lol! 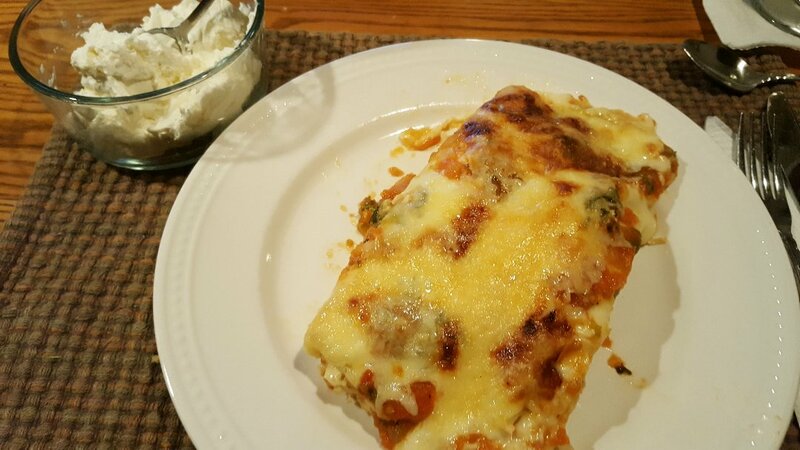 I used the salsa to make Baked Chicken Enchiladas. They were delicious, and that salsa was something else. No more store-bought! (That seems to be my new philosophy these days lol! )...I wanted to make something Mexican because, see up on the left? That is my homemade sour cream. Well...I actually followed the recipe for Cream Cheese...but it did not taste like a cream cheese I'm used to at all. I'm sure that most homemade cream cheeses don't taste like Philadelphia cream cheese...which most of us are used to. I did some research and learned that Kraft adds a sweetener to make it palatable. I'm not giving up though. I found a few tips online to make the "sour cream" into a sweeter cream cheese. I'll update next time I make it! Happy Birthday to Marlene, her story has a happy ending I am glad, kind of sounds like the lives some people experience. Spoiled dogs, and a lucky bunch. Your enchiladas look delish. We share the same new philosophy, No more store-bought! The more I garden and learn about preserving food the more I am excited about knowing what is in my food and how it was grown. Besides that, it feels so good to have your own canned stores for winter. I absolutely love how you baby your animals . . . why would they ever want to run away. Happy Birthday Marlene!!! I have a soft spot for huskies...and her eyes! They remind me of my Tor's eyes. Ice blue. Those enchiladas look divine!!! Do you do an enchilada sauce? I don't like the store bought sauce and can't be bothered to make my own (pure laziness) so I wonder how others make theirs. 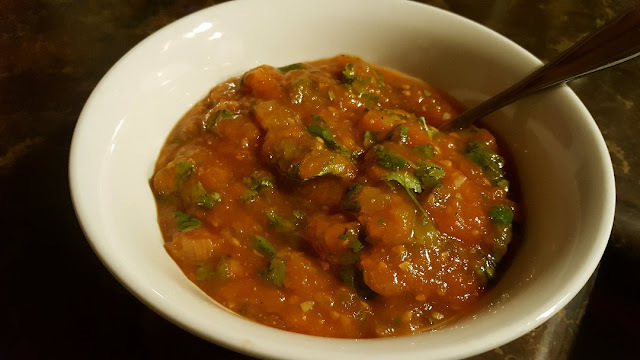 I love making homemade salsa - so delicious over anything in a jar for sure!! I made a Mexican lasagna for Samhain dinner using tortilla wraps instead of lasagna noodles. I was quite good but made a ton! More than half went into the freezer for another supper! 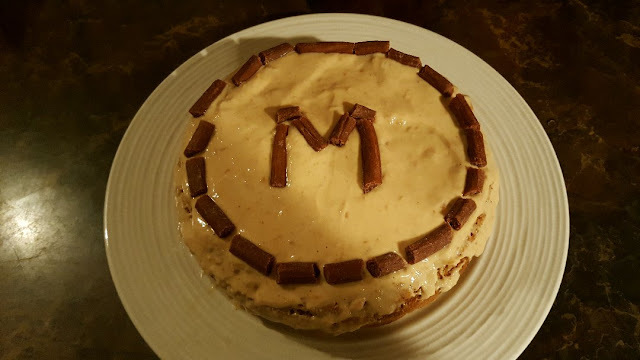 Happy birthday to Marlene! Glad she found such a wonderful Forever Home with you. I buy my dogs hog jowls at the grocery store. I put in an order with the butcher, and he cuts the hog jowls up just the right size. If you haven't ever seen hog jowls up there in Canada, think of a big thick piece of bacon, about two inches thick. Sure did like the picture of your pack. 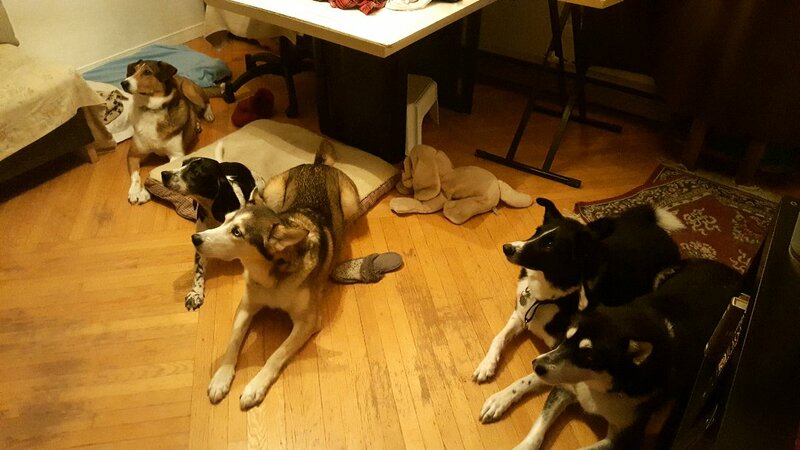 They all look like good dogs, and you can feel really safe, not even an idiot would try to break into your house with those dogs inside. The good thing about dogs, they always appreciate any little thing you do for them, and they never, ever forget that they are your friends. I bet the cats were glad to get their share of party rations. My cats get canned cat food mixed with "Meow Mix" or "Kitn'Kaboodles" which is dry cat food. But my wife has to cook ground turkey or chicken for Rufus the dog, as he is too old and missing too many teeth to eat anything he has to chew. Good post. Light hearted and uplifting. Home made is great, I like lots of cilantro in it, fresh from the garden. I felt so sad reading Marlene’s story, however, she ended up happily ever after with you and Alex. May Marlene have many more birthdays. I felt my heart breaking reading about Marlene's past. Oh my gosh...so sad. I'm glad she's with you now living such a happy life and being loved by you and Alex; both such kind souls. Happy birthday to Marlene! Marlene, cake, and the pack are priceless! Great shots. I have to agree about the homemade versions of cream cheese and sour cream. But of course, most of the food we're used to doesn't look or taste like their homemade true-food cousins. Yogurt cheese comes pretty close, I think. If you a find better cream cheese recipe though, let me know! Marlene ks so lucky to be one if your fur babies. You are such a great pet owner. I am lucky that my hubby is half Mexican. Store bought salsa never graces our table and we believe in making it hot. Thank you Christine :) I think the dogs deserve to be spoiled! They are our fur-kids and very much part of our family. It's fun to watch how excited they get when they see that cake lol! Thanks Debra :) I'm really glad we found her because nobody wanted her anymore, :(...poor her, but now she's happy and very much loved! Hi Harry :) I think I've seen the hog jowls here, I remember seeing it looking like bacon. That sounds like a nice treat for your dogs! We give them raw hide bones, but they are very strictly monitored. If bone splits or splinters...into the trash. I don't take chances with those things, but the dogs need to chew to release some of their energy. They get half an hour a day of bone time, otherwise, I'd go bankrupt buying bones! :) People think that dogs have no memory, but I know they do. They remember more than we know and you're right, they never forget who was good to them! I don't think we ever have to worry about intruders here. When one of them starts barking, they all go and it's LOUD...Jack has the biggest scariest bark for such a little fella! Hi Gill :) I love how the cilantro made the salsa. The original recipe I found didn't have any and I'm glad I added it! Thanks Leigh :) You're right about that and it's funny because over the last few years, making my own food from scratch, I do know that homemade never tastes like packaged...so I was surprised that I didn't realize my cream cheese wasn't going to taste like Philadelphia cream cheese...why would it??? But...having said that, it was still too sour for us. I'll let you know, Kristina just posted a link in her comment that I'm going to check out. Thanks Kristina :) I'm off to check out your link. I often wonder if the milk I'm using is making all of my creamy type of products more sour than they should be. People seem to have a lot of success when they use raw goat's milk. Thank you Marsha :) I just love our pets so much...I feel grateful that we have so many wonderful fur babies! :) I want to get to that place, where store-bought ANYTHING doesn't grace my table...don't know if I can though. But I'm trying my best! Our stomachs can't handle hot though, but the mild salsa is still pretty tasty! I hope your hubby is doing better! Your meal looks as good as that CAKE! I am a sugar nut so the cake looks the best to me! haha....Happy Adoption Day sweetie. Looks like to me she is where she needs to be. Thank you Pam :) I always say we found Marlene but I think she found us :) I don't think you would have even gotten a nibble from that cake with all the canine competition lol! Rain - you take such good care of your dogs and cats - i love you for that! your dogs and cats look so well-behaved and happy! plus you make all of that delicious food and your gorgeous cheeses! anytime you want us and the 4 stray cats to visit - just let us know! we could probably even round up a few more strays if you needed extras - bahahahah! the enchiladas look to die for...OMG! i just thought of a movie you and Alex would love! it's called "To Die For" and it's a mockumentory starring Nicole Kidman and Joquin Pheonix. if you haven't seen it - you just might love it. it's hysterical! As a Texan who eats salsa all the time, I must say that looks pretty darn good!!!! Heck it all looks good! Man, what good eats at your house! I didn't know dogs could have cake. Marlene has pretty fur coloring. What a story she has; breaking windows to get out? Wow; what a smart and brave dog and to even be able to track down her owner's car? Dang! I can't wait to see what Halloween outfit you sew. I know you live in a remote area. How far away is your nearest neighbor? Thanks Stefanie :) Marlene is such a smart dog. Her previous owner runs a restaurant and they lived about a 10 minute walk, so Marlene knew the area well. I just felt so bad knowing that she was so scared to be alone that she would break a window to get out of the basement...the area I live is remote from any city, but it's a village of just under 500 people scattered around a lake. Unfortunately our nearest neighbour is across the street. We are in the village center. Soon though we want to be much more remote with nobody around us for miles if we can swing it! Your village sounds like Three Pines. 500 is how big my daughters' former elementary school is. Thank you about my brownies. They did taste very good. I usually get my brown sugar from Costco, which thankfully sells organic. I will try to make hash browns one day. I know it's a lot of prep work with having to peel the potatoes and squeezing out the starchy water as best as one can. Oh! Happy Birthday Marlene!!!! What sweet pictures of them out in the snow and also waiting for the birthday cake...too cute! Glad your leg is doing better...my daughter had something similar in her arm and I told her to do stretches as I think it was a pinched nerve. She's getting better too. Homemade sour cream would be good too....and the salsa I have been thinking of making too but I should have thought of it when I could have gotten good garden tomatoes...oh well. Better late than never. The breads look good...I'm making bread today as I need it and I want to make a refrigerator french toast casserole. You make the casserole and then it sits in the frig overnight. I've had it before but didn't have the recipe so I went on All Recipes....I'll let you know how it turns out later this week. Happy adoption day to precious Marlene! cake was finished in 20 seconds ? wow what a speed ! they look lovely and well behaved pack Rain! and Marlene founds to found true love from you both as she got adjusted in your adorable bundle of beauties. Sala looks INVITING!!! i envy your skills for cooking and almost everything ,so inspirational my friend! Hi Stefanie :) I've made some good potatoes, and I don't go to the bother of releasing the starch anymore. I just chop them up and fry them with onions in butter, on medium, until they're brown and crispy on the outside but soft on the inside. That's one of our favourite meals with chicken bits too. 500 people is STILL too much for me lol! Thanks Sam :) I thought maybe my leg had to do with a pinched nerve too, just because I don't always have the best posture when I'm on the computer. I have a post-it now to remind me to keep my back straight! The refrigerator casserole sounds interesting! I like anything that I can prepare early and then just pop into the oven! Thanks Baili :) Yes, but likely the cake was finished in LESS than 20 seconds lol...they just gobbled that down fast! The pack is really good...we have found some kind of magic formula to train them so that they actually listen to us lol...Stella is still a little bit stubborn, but she's only been here a few months and I think she feels like she lost her power or something! She used to be in charge of her and Pavlov, now she has to get used to being a little lower on the "totem pole"...so it takes her a while to actually do the commands. She knows them, but she's resistant, silly girl!